↑ "John Paul II Biography (1920–2005)". http://www.biography.com/search/article.do?id=9355652. Retrieved on 2009-01-01. ↑ http://www.dw-world.de/dw/article/0,2144,1979145,00.html. Retrieved on 2009-01-01. ↑ "Table of the Canonisations during the Pontificate of His Holiness John Paul II". http://www.vatican.va/news_services/liturgy/saints/index_saints_en.html. Retrieved on 2009-01-01. 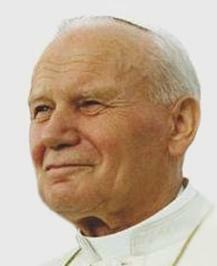 ↑ "John Paul II declared http://www.catholicnewsagency.com/news/john_paul_ii_declared_venerable_moves_one_step_closer_to_sainthood/. Retrieved on 2010-02-25.